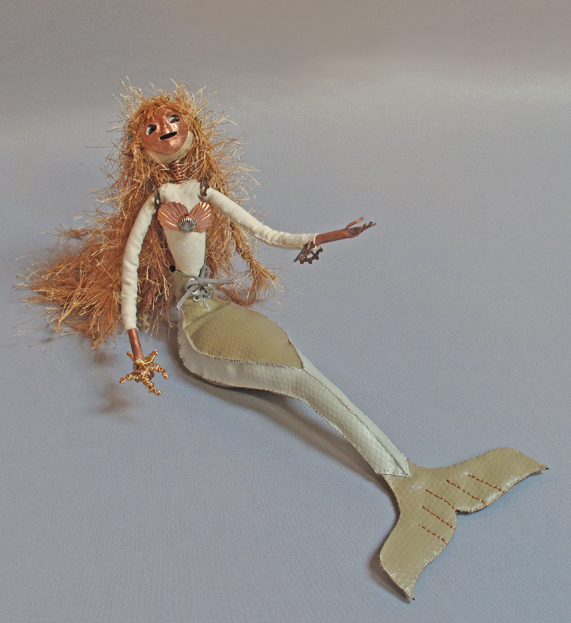 Mermaid Song is my newest art doll. For an earlier mermaid doll I forged an all copper tail. I decided allow materials to drive creation with this siren of the deep. I source some materials for my work at a local “creative reuse” center known as the Scrap Exchange. Upholstery samples provide a great inspiration starting point. Within a stack of faux-leathers I had several colors of materials with a dappled pattern impression. They reminded me of fish scales, and called to be part of a new mermaid doll. I tried some other new things with the construction of this sculpture. 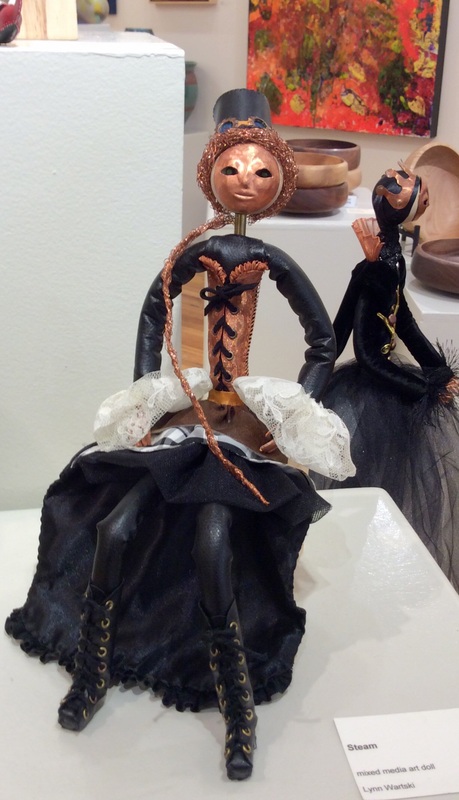 Along with my last, “Barre-ing Degas”, this doll has hands created from a narrower diameter copper tubing. I think this brings the hands into better proportion with the rest of the doll. It does require I work to an even more exacting tolerance when cutting fingers in the end of the tube I flatten to form the palm and fingers. Another new technique I employed was making a small sandbag to include within the doll to ensure that she would sit up while still having her head tipped back singing. Mermaid Song will be off to the gallery soon. This entry was posted in Art Dolls, Art Shows and tagged art doll, copper, figure, figure sculpture, mermaid, mixed media, one of a kind, sculpture, steampunk, the Hillsborough Gallery of Arts on November 18, 2014 by lynnadmin. I find myself working at the Hillsborough Gallery of Arts today. I always try to take images of the art around the gallery when I’m here, and make posts to share all the wonderful work a visitor may discover. More often than not, I take shots of the work of artists other than myself. 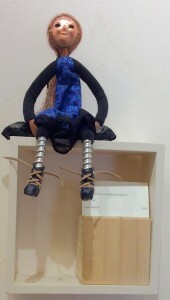 Today I thought I would walk around and look at my art dolls with the eyes of a visitor to the gallery. Nobody’s Fool is sitting on a high pedestal grouped together with others that all have art dolls on them. She appears to be holding court from that position. Future Thoughts is sitting in the gallery’s front window. From this angle she appears to be a bit sceptical of the viewer. Good thing most visitors look at her from the front through the window. Fly Girl stands beside a beautiful carved pottery vase. 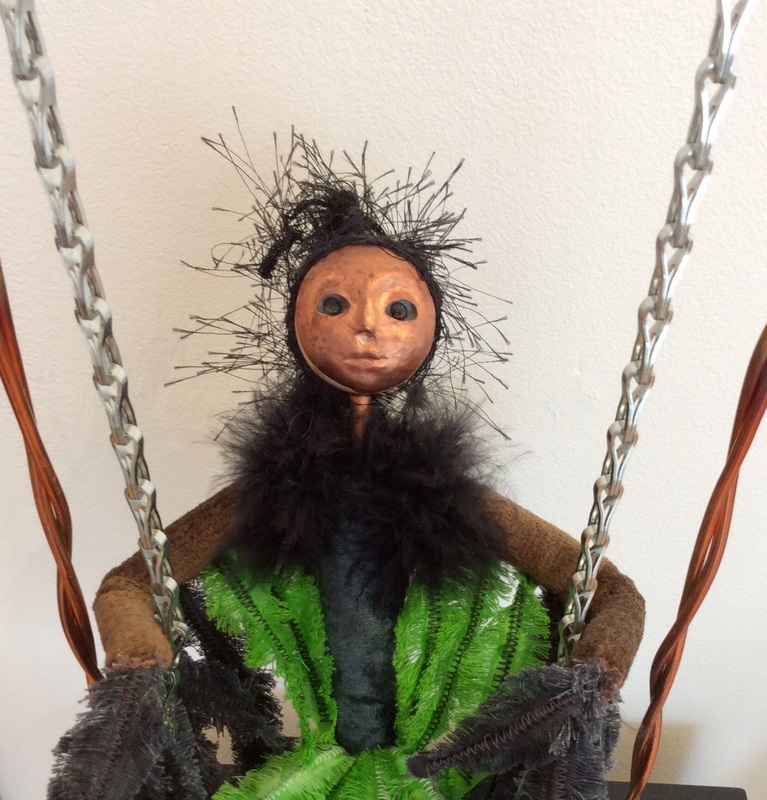 From this angle, I think that my art doll Bird Girl looks a bit surprised that you can look down upon her swing. Lily is perched on a shadow box on the wall in the print room where along with cards and prints, a visitor to HGA can find an example of work from each of the member artists and handy bio-cards that describe the work of each. Steam is in the same pedestal grouping of art dolls as Nobody’s Fool. She looks commanding as well. Art doll ZIggy adds a bit of sparkle to a pedestal by the wall. There are a few more of both my art dolls and other sculptures around the gallery, but I guess you’ll have to stop by to see the rest. This entry was posted in Art Dolls and tagged art, art doll, figure, figure sculpture, Hillsborough Gallery, mixed media, North Carolina, one of a kind, sculpture, steampunk, the Hillsborough Gallery of Arts on November 5, 2014 by lynnadmin.